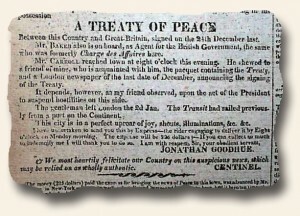 Today I traveled to Boston, Massachusetts, by means of the Boston Gazette dated June 5, 1815. I found they were celebrating the arrival of the U.S.S. Frigate Constitution, also known as “Old Ironsides.” For the fate of this vessel, so long the object of pride and hope, to New England especially, no small solicitude was generally felt… But on Saturday evening the frigate Constitution, arrived in the lower harbour, much to the gratification of every beholder. The waves of her native waters welcomed home the ship that had thrice fought and conquered; and the citizens of Boston, the town that first launched her on the element where she has been so greatly distinguished, have given her captain on his reaching the shore, the cheering reception his gallantry merits — Hull, Bainbridge and Stewart.” This then continues with a lengthy article “Old Ironsides — Anecdotes of The Constitution”. 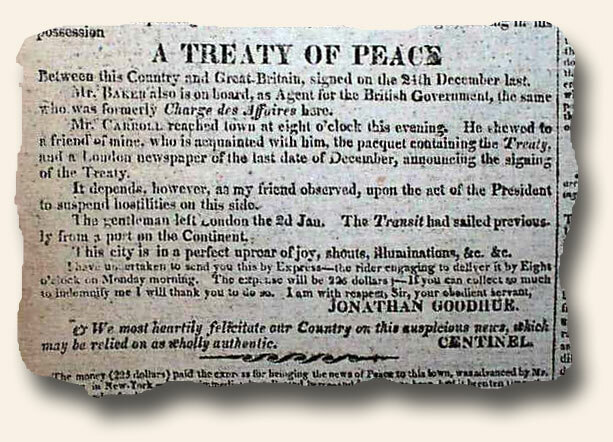 This peace treaty ended the War of 1812 between the United States and Great Britain and Ireland. Due to lack of telecommunications and time travels at that time, even though the treaty was signed December 24, 1814, the Battle of New Orleans was fought and won on January 8, 1815 and the Treaty was not in effect until it was ratified by the U.S. Senate on February 18, 1815. Also reported is “The Brutal Enemy!”. “We learn that the enemy have descended the Rappahannock. Accounts from there state that their ascent up there was marked by a conduct every way worthy of the infamous Cockburn, plundering and burning on both shores and almost everything within their reach… They have laid in ashes the Court-house, prison, collector’s office, clerk’s office, and a large ware-house, and scarcely a building escaped plunder or damage… they broke into the family vault of Col. Richie, and ransacked the ashes of the dead…”. 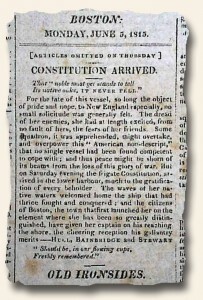 Today I journey to Boston, Massachusetts, by the way of the Boston Gazette dated September 12, 1814. There I found the headline “Escape of the British down the Potomac”. “The Intelligencer of the 7th inst. states, that from several of the gallant officers, under Com. Porter, and our other naval heroes, who were stationed at the White Houses, a few miles below Mt. Vernon, on the Virginia side, we learn that a very severe engagement commenced between the enemies armed vessels, and the battery stationed at the formed place, about 2 o’clock on Monday evening. The battle lasted for some time, and ended in the loss of about 12 killed, and 17 wounded on our side, principally sailors. The seamen distinguished themselves by their usual intrepidity and coolness, and the militia stood their ground with much firmness… About 4 o’clock on Monday evening, the contest commenced between them and the battery under the command of Capt. 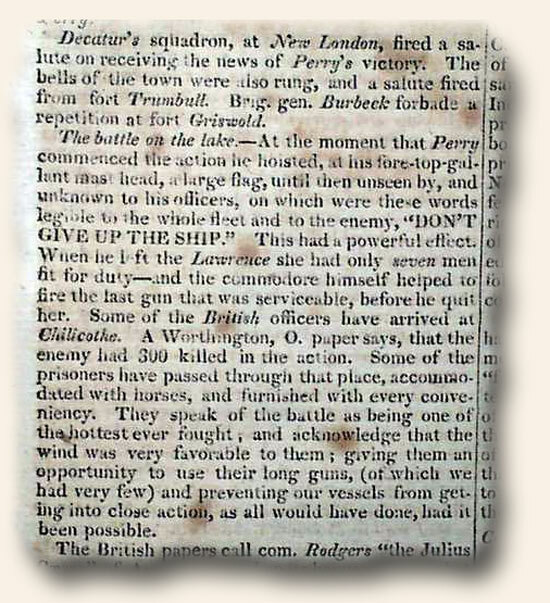 Perry,… We have not yet heard how it terminated; but there is no doubt but Perry has severely mauled the enemy, and upon the whole, that the vessels have been so severely handled, that he will not hastily venture up this river again…”. Also in the issue is a large advertisement for “The Town of Harmony with all its Improvements, and about 9000 acres of Land adjoining — on which are Three Villages, in the tenure of George Rapp and Associates is Offered for Sale…”. 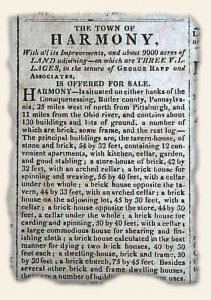 This town is located in Butler County, Pennsylvania, and the advertisement provides a detailed description of the town. George Rapp was born in Germany and began his own preaching – breaking away from the Lutheran Church. His group was banned from meeting, so he moved to America to be able to have religious freedom. Harmony was one of the towns that he established. 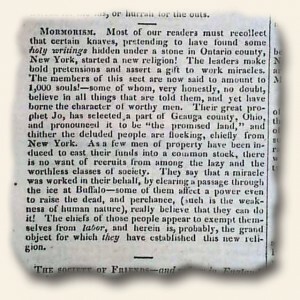 This post is taken almost entirely from the work by Bill Earle at www.nilesregister.com, whose database of the entire run of this notable newspaper provides a very inclusive perspective of life not only in America but the world for much of the first half of the 19th century. But this post offers insight beyond the Niles’ Register. It provides a perspective of the broader scope of newspaper publishing from this significant era. The national and international newsweekly Niles’ Register is well known today primarily to collectors & those and genealogists who have sampled its treasures. But in the first half of the 19th century, the Register was as well known as the New York Times and Washington Post are known today. From 1811 to 1849, it was the principal window through which many Americans looked out on their country and the world. The scope of the work was immense, its circulation was large (the largest in the United States, by some accounts), and its influence was reflected in generous compliments from such readers of the publication as John Adams, Thomas Jefferson, and Andrew Jackson. The Register was founded by Hezekiah Niles in Baltimore in 1811. A printer and journalist of Quaker background from the Wilmington-Brandywine-Philadelphia area, Niles had worked in Philadelphia and Wilmington before moving to Baltimore in 1805 as editor of the “Baltimore Evening Post”. 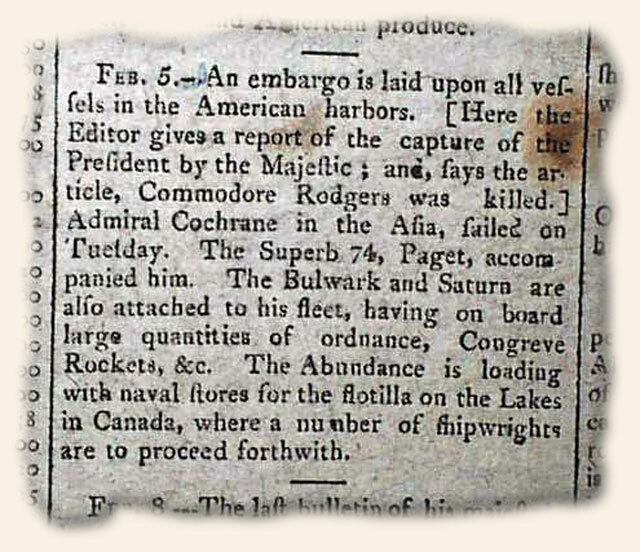 When that paper was sold in 1811, he launched his “The Weekly Register“. The editor had large ambitions: he intended to be “an honest chronicler” who “registered” events not just for his contemporaries but for posterity as well. Although politics would be covered extensively, the Register would eschew any partisan slant — “electioneering,” as the editor called it. Furthermore, the paper would ignore local news in favor of national and international news. The paper would cost $5 per year, a premium price in an era when a dollar might constitute a generous day’s wages. Niles had secured some subscribers before his first issue appeared on September 7, 1811, but those initial subscribers would be able to cancel after 13 weeks if the work did not meet their expectations. After six months, however, Niles was able to boast that few initial subscribers had withdrawn. Furthermore, so many new subscribers had signed on that the editor had had to produce three printings of some early issues to supply those who wanted complete sets of the new publication. Niles would never get rich producing the Register–his published complaints about slow subscription payments are a recurring theme throughout his career–but the paper was clearly well established almost from the outset. The value that subscribers saw in the publication is easy to understand. It was exceptionally dense with material: there was no advertising, and only a handful of illustrations ever appeared (desired issues by collectors); consequently, the pages were packed with text. Furthermore, Niles frequently added extra value to the basic publication. He would occasionally reduce the type size if momentous events left him with important material that he needed to “get in,” or he would extend the regular 16-page length of the paper by adding extra pages. On a number of occasions, special supplemental volumes on topics of particular interest — occasionally amounting to hundreds of pages — were sent gratis to subscribers. 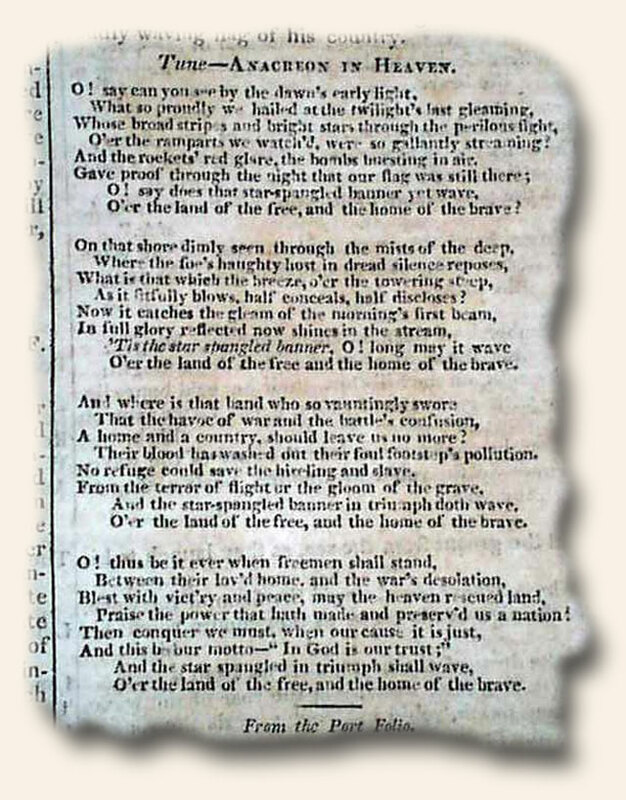 One such supplement carried a very early printing of the Star Spangled Banner. In addition to the sheer volume of material, there were two other outstanding aspects of the Register which distinguished it. First was its scope. While The Register emphasized political, commercial, agricultural, and industrial news, and paid only limited attention to cultural or social issues, it reported on events worldwide. Foreign coverage was more abbreviated than domestic reporting, but major events abroad were routinely summarized. Furthermore, Niles drew both domestic and foreign news from a host of sources — his own reporting and extensive correspondence, foreign newspapers and domestic “exchange papers,” commercial correspondence received in the major international port of Baltimore, and private correspondence passed on to him by friends and acquaintances. Finally, he emphasized “getting in” texts of major documents — texts of treaties, laws, and court decisions, transcripts of speeches, official reports, and records of Congressional proceedings (perhaps a quarter of the 30,000 pages that the Register eventually contained were given over to proceedings in Congress). Collectors love that Niles included within its pages the declaration of War for the War of 1812, the constitutions of many states as they entered the Union, inaugural addresses of Presidents of the era as well as their annual state-of-the-union addresses, the Monroe Doctrine, and virtually every other national document of note. For any significant national event “Niles Register” can be counted on to provide a detailed account. Second was its even handedness. Niles’ pledge in the first issue of The Register to avoid party politics distinguished the paper from much of the American journalism of the era. Many newspapers in that day represented parties, or factions within parties, or even particular candidates, and political reportage was usually one-sided and strident. 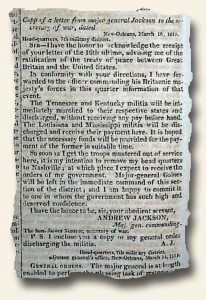 The Register, however, ignored the petty disputes between “the ins and the outs.” As a result, there is a balanced quality to the Register that gave it an authority no other publication of its time could match. One other great advantage favored the Register: the richness of events in the era. The Napoleonic Wars were still going on when the Register first appeared, and its pages were soon thereafter crowded with the events of the War of 1812, reporting in fine detail all major battles both on land & the sea. The Texas war for independence including a nice account of the Battle of the Alamo can be found within its pages. Indian wars and foreign revolutions erupted periodically, and the war between Mexico and the United States occurred late in the period. Domestic debates about major national issues–the tariff, public land policy, slavery, internal improvements–continued ceaselessly. Industrial and technological developments abounded (the steam engine, the building of the Erie Canal & other canals and railroads, introduction of the telegraph), and an ample cast of larger-than-life characters was readily available–Napoleon Bonaparte, Tsar Alexander, the Duke of Wellington, Queen Victoria, Andrew Jackson, Davy Crockett, Sam Houston, John C. Calhoun, and so many others. It was an accident of history that the Register had all these fascinating developments and personalities to cover, but Niles made the most of it. Hezekiah Niles’ editorship of the Register lasted 25 years. In 1836, advancing age and declining health obliged him to turn the paper over to his son, William Ogden Niles. William Niles had been raised as a printer/journalist, and was involved with other newspapers both before and after his term at the Register. His first editorial showed him to be his father’s son: he expressed himself determined to “maintain the well-earned reputation of the Register” and to “record facts and events without fear or favor, partiality or affection, — in brief, to preserve its national character.” However, he quickly showed that he had his own ideas, too. His first issue expanded the traditional format of the paper, he changed the paper’s name to “Niles’ National Register”, and he soon moved the paper to Washington, D,C., evidently hoping to extend the paper’s national political influence. However, the move to Washington failed. The paper returned to Baltimore in 1839 and William Ogden’s tenure as editor ended that same year. During his editorship, legal title to The Register apparently remained with Hezekiah. When Hezekiah died in 1839, William Ogden’s step-mother, Hezekiah’s second wife, sold the property and William Ogden was out. Jeremiah Hughes bought the franchise. A long-time resident of Annapolis (he was in his mid-fifties when he acquired the Register), Hughes was cut from the same cloth as his long-time friend, Hezekiah Niles. 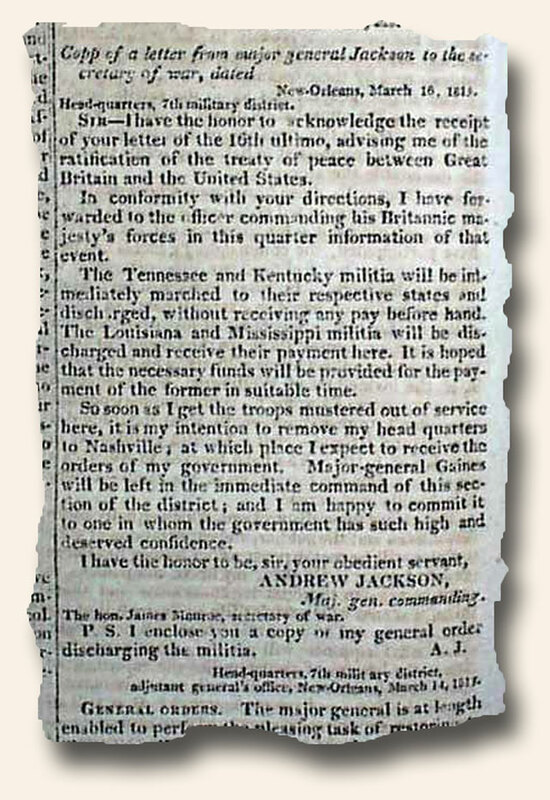 Both had served in the militia in the War of 1812. Most importantly, however, Hughes was a journalist, having been publisher of the Maryland Republican at Annapolis for many years. 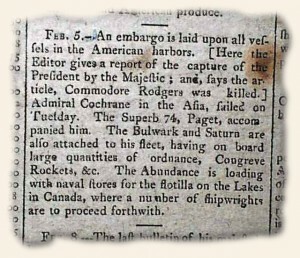 Thus, although the Whig partisanship of the Register increased notably during Hughes’ tenure, its essential news-reporting function was unimpaired. Hughes’ editorship lasted until 1848 when business difficulties and declining health persuaded him that he could no longer publish The Register. It was suspended in March. The cause of the Register’s suspension is not clear. It may have resulted from nothing more than the ordinary ebb and flow of fortune in the publishing business. In a broader sense, however, the Register was clearly losing its special place in American journalism. 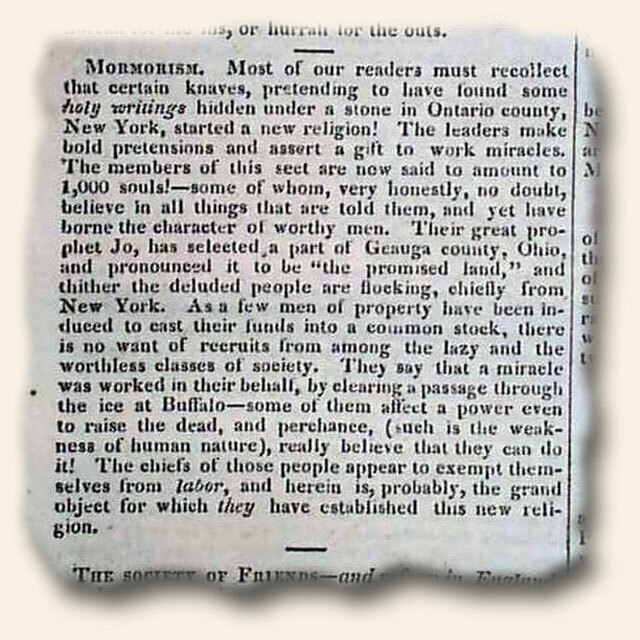 The paper’s cachet had always been two-fold — its concise news summaries from around the United States and the world, and the relatively non-partisan tone of its political coverage — but the uniqueness of both these characteristics was being eroded by the late 1840s. First, improved communications were making it easier for daily newspapers to offer the coverage from elsewhere that Hezekiah Niles had originally had to cull out of ship letters and exchange papers. By the 1840s, faster mail service via steamboats and railroads, as well as spreading telegraph lines, had deprived the Register of its exclusive franchise on this kind of reportage. Second, partisanship in American journalism was declining. By the 1840s, the newspaper business was established as an industry in its own right. Rising literacy rates were giving the newspapers a growing market at the same time that improved printing processes were yielding a more affordable product to that market. The newly independent newspapers began to replace their former dependence on political ideology with a developing journalistic ideology, “objective” journalism, journalism without an obvious partisan slant. It is ironic that the Register missed this development in journalistic style. 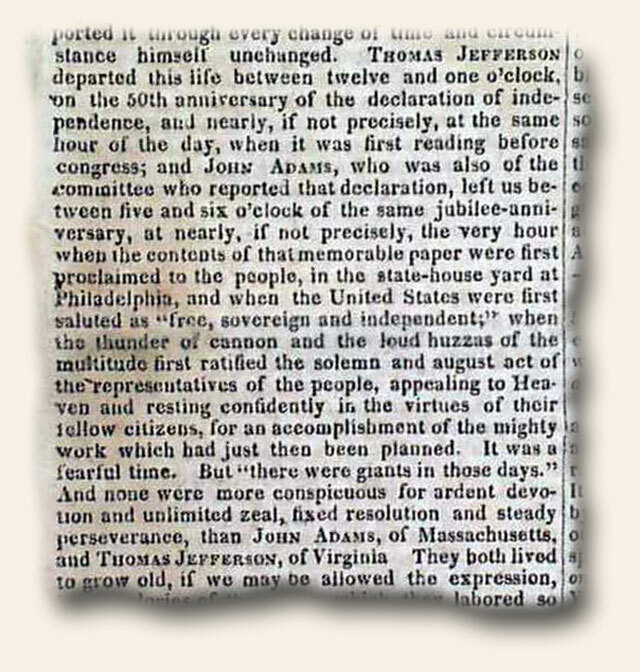 Hezekiah Niles had pioneered “objective” journalism–indeed, he is sometimes called its progenitor–but Jeremiah Hughes’ Register of the 1840s was much more clearly a partisan Whig publication than it had been in earlier years. Any partisan alliance would have hurt a paper such as Niles’ Register at a time when partisan journalism was waning, but an alliance with the divided and dying Whigs was particularly unfortunate. 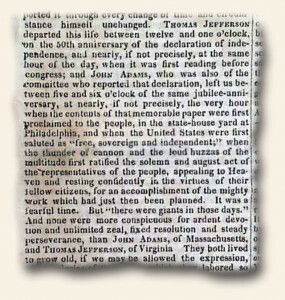 Whatever caused the paper’s decline, it remained suspended until July, 1848. It then reappeared under the editorship of George Beatty from new headquarters in Philadelphia. Little is known about Beatty, but he apparently was a novice at publishing when the opportunity to acquire the Register arose. However, he made a serious effort to revive the franchise, and ran it for a year. But it was too little, too late. Beatty’s journalistic inexperience showed too clearly in the paper’s pages, and the Register’s place in the marketplace disappeared. 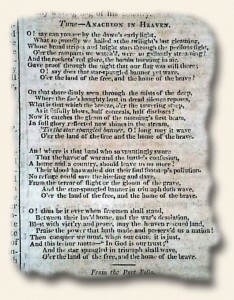 The last regular issue appeared in June, 1849. Three abbreviated issues appeared in September, 1849, but they were the last. In one sense, however, the publication never died. The full 38 years of the Register’s run is a common holding in libraries (either in paper or in 20th-century-produced microform), and bound volume commonly turn up in library deaccessionings. They are often found on booksellers shelves as well. Collectors relish the wealth of content while acknowledging its small size (some argue it was a magazine and not a newspaper) does not fit the expectation of a newspaper. But if any collector wished for a single-title collection of major events from 1811-1849, Niles’ Register would be the undisputed choice. Consequently, it remains available for historians, genealogists, and certainly collectors of old newspapers. As one historian has said, “Probably no day passes without some researcher digging into the information supplied with so much care and responsibility by Hezekiah Niles.” The statement was made several decades ago — and Niles would be delighted to know it is still true. A few weeks ago we had some interesting comments on what collectors thought was the most historic 20th century newspaper report. Let’s try the same with the 19th century. But given the tremendous diversity of events from 1801 thru 1900 I’m going to break the century into three parts: pre-Civil War; the Civil War; and post-Civil War. Let’s work our way backwards and discuss the post-Civil War era first. There are many ways to approach “most historic”. My approach will be the most life-altering event with emphasis on “event”. One could argue that the second Industrial Revolution dramatically changed the world but it cannot be pinned down to a single date or event. Several items come to mind: the first successful Atlantic cable in 1866 was a major step in causing the world to be much smaller–a trend which continues to this day; the completion of the transcontinental railroad in the United States was a major step in the westward expansion & settlement of the United States which changed the country in many ways; and then there is the Battle of Wounded Knee which was the last battle in the American Indian Wars and the official end of the Old West. Not to be omitted would be the invention of the automobile by gentlemen in Germany in 1889. I’m going to go with the completion of the transcontinental railroad. In thinking of the multitude of events which played off this event and how it changed the fabric of America (pardon the ethnocentrism) I’ll vote for it as the most historic event of the 19th century post-Civil War era. 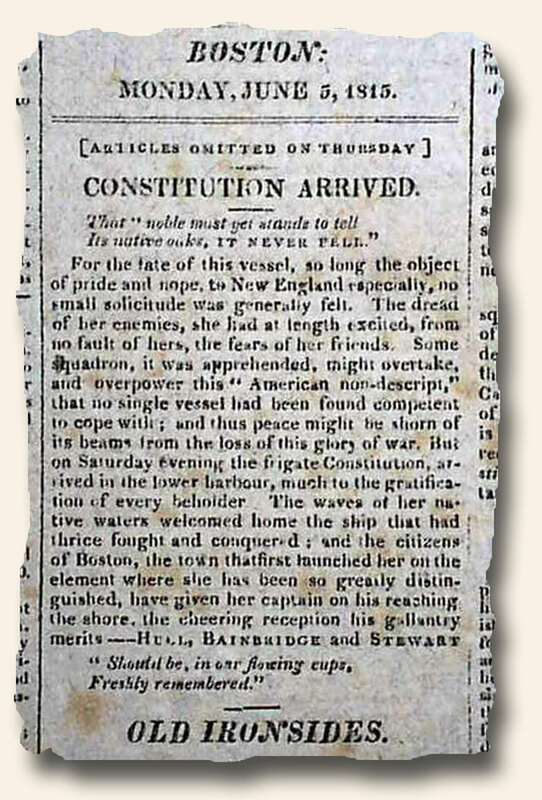 Today I journeyed to Boston through the Boston Gazette of December 2, 1813. There I found numerous reports pertaining to the Battle of Chrysler’s [Crysler’s] farm. Within this one issue is the “American Un-Official Accounts”, the “British Official Accounts” and the “American Official Accounts”. This battle took place on November 11th between the British under the command of Lieut. Col Morrison and Canadian under the of command Capt. 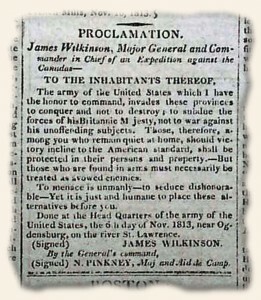 Mulcaster against the Americans under the command of Maj. Gen. Wilkinson, fighting on both land and on waters. The American troops encountered a high number of injuries and deaths “…The dead rest in honor, and the wounded bled for their country and deserve its gratitude…”. Also included is a proclamation from *Maj. Gen. Wilkinson. “…Those, therefore, among you who remain quiet at home, should victory incline to the American standard, shall be protected in their persons and property — But those who are found in arms must necessarily be treated as avowed enemies. To menace is unmanly — to seduce dishonorably — Yet it is just and humane to place these alternatives before you…”. If one didn’t know better, this proclamation sounds as if it may have come from a non-American General (see note below). *Background (wiki): James Wilkinson (March 24, 1757 – December 28, 1825) was an American soldier and statesman, who was associated with several scandals and controversies. He served in the Continental Army during the American Revolutionary War, but was twice compelled to resign. He was twice the Commanding General of the United States Army, appointed first Governor of the Louisiana Territory in 1805, and commanded two unsuccessful campaigns in the St. Lawrence theater during the War of 1812. After his death, he was discovered to have been a paid agent of the Spanish Crown.